To say it's been a while would be something of an understatement. I honestly can't remember the last time I did a WIWW post. Somewhere along the WIWW road I seem to have lost my way along with a hefty dose of fashion-y motivation. I've been bored with my look, such that it is, and have drifted along wearing my usual stuff (sometimes an actual outfit, more often than not, not) without challenging myself to shake things up and try something new. Until this weekend. 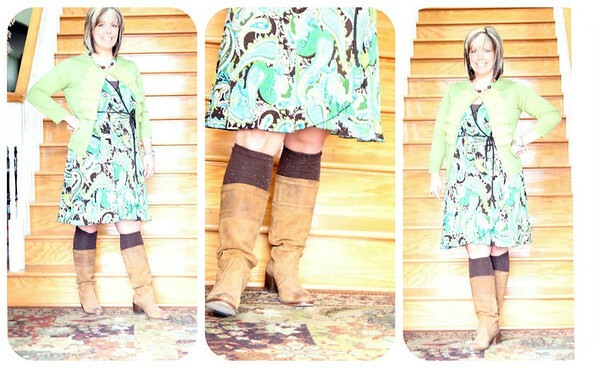 We had a cold spell Sunday (yes, it was actually cold here in south Texas) so I decided it was the perfect time to try out a new pair of boot socks with a dress. I felt kind of edgy and cool but then, but then, I let doubt creep in. Can I, the 43 year old mama, wear boot socks? And while maybe I can, were they the right look for this dress after all? This I do not know. Should I have pushed them down a bit so they were more leg warmer-Jennifer Beals-y? Pulled them up onto my thighs? Ditched them completely and gone with tights? Do tell. Please. 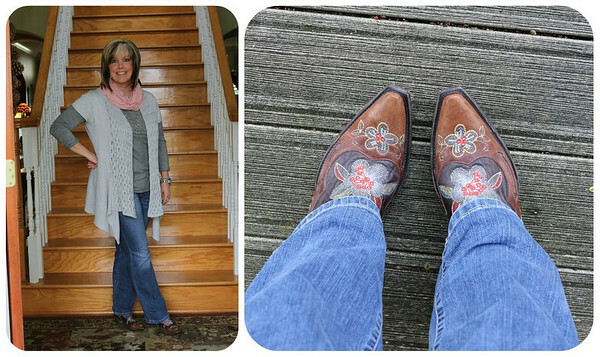 grey shirt, jeans & drape-y cardigan: Target; pink ruffle neck rag: TextileMonster; boots: Old Gringo Bonnie (from Santa); and it's hard to see in the photo but I also wore a long silver loop necklace from Kohl's. 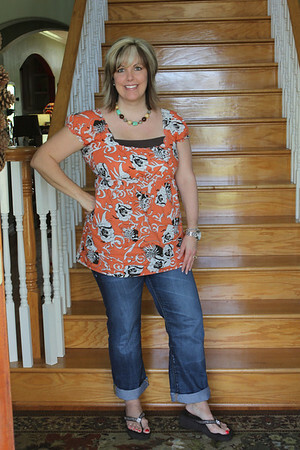 Then the next day we had a warm spell (again), so I just threw on one of my stand-by tops & jeans. And that, my friends, is me easing back into What I Wore Wednesday. Will I do a WIWW post every week? Maybe. Probably not. But I am challenging myself to switch up some of my *regular looks* a bit and try some new things--without shopping outside my closet (okay, maybe thrifting is okay) and to get myself together more days of the week then I have been. I'm linking up at The Pleated Poppy, clickety-click on over there for oodles of fun fashion inspiration. I love the print on that dress - so pretty! I love the socks and boots - that is one of my favorite looks! : ) Hope you're having a good week! I haven't done WIWW in ages because I have nothing new to show. My winter clothing is not varied at all. I kind of hate winter, so I don't have a lot of appropriate clothing. So maybe I'll have more to show in spring. I think the boot socks are a little heavy for the dress. But maybe that's just me. I love the socks/boots! I finally tried them and enjoy the look. Plus I'm older than you. ;-) So OK. Great drapey cardi and those Gringo boots. SWOON. Very cute outfits and I love the boot socks. Plus you don't look like you're 43. The dress is super cute.